Melt butter in a skillet over medium low heat. Add shallots and cook, stirring occasionally, until soft, 5 minutes. Add wine and simmer until reduced by half, 3 minutes. Add cream, lemon zest and juice, chives, and salmon. Warm over medium-low heat, without boiling, until hot through, 1 minute. Add salt and pepper to taste. Meanwhile, cook pasta in a large pot of boiling, salted water, until firm to the bite. Drain, reserving 1/2 cup pasta water. Add pasta to the hot sauce. Toss well to coat, adding reserved water as needed. Top with salmon roe, if using. Serve immediately. Thin to medium ribbons -tagliolini, fettuccine, tagliatelle. Heat oil in a skillet. Add onion and garlic and cook, stirring constantly over medium high heat, until softened, 5 minutes. Add tomatoes. Simmer rapidly until just thickened, 10 minutes. Add tuna and cook until hot through, 3 minutes. Add salt and pepper to taste. Meanwhile, cook pasta in a large pot of boiling, salted water, until firm to the bite. Drain. Add pasta to the hot sauce. Toss well to coat. Serve immediately. Strands, thin ribbons or tubes - spaghetti. linguine or penne. Make sauce up to 2 days in advance. Cover and refrigerate. Add 1 tbsp rinsed capers and 12 sliced pitted black olives to the pan with the tuna. Finish as directed. Scrub clams under running water. Discard any that are broken or not tightly closed. Place clams with wine in a large pot with a lid on. Steam over medium heat until shells are open, shaking pot occasionally to ensure even cooking, about 5-6 minutes. Use a slotted spoon to lift out clams, and set aside. Discard any that do not open. Tip the pot and slowly pour out the clear clam and wine juices, taking care to leave the sandy residue in the pot. Reserve juices and discard residue. Remove clams from shells and reserve, discarding shells. Cook pasta in large pot of boiling, salted water, until firm to the bite. While pasta is cooking, heat oil in a skillet. Add garlic, red pepper flakes, and parsley. Cook over medium heat until fragrant, 1 minute. Add reserved clam juices and boil vigorously for 1 minute. Remove from heat. Drain pasta. 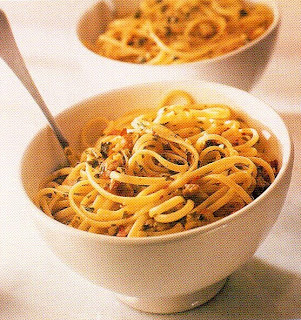 Add pasta to hot clam juices. Return to heat and cook, tossing constantly for 1 minute. Add clams and 2 tbsp additional olive oil and toss well. Add salt and pepper to taste. Serve immediately. Strands or thin ribbons spaghettini, spaghetti, linguine. A simple variation for this recipe is to replace clams with mussels. Cook as directed above. You could leave a handful of mussels in their bottom shells as a garnish. Cook pasta in a large pot of boiling, salted water, unlit firm to the bite. While pasta is cooking, heat oil in a skillet. Add garlic, parsley, crumbs, and red pepper flakes and cook over a high heat, 1 minute. Add scallops and cook, stirring constantly, until just turning opaque, 1-2 minutes. Add salt and pepper to taste. Drain pasta and add to hot pan. Toss well to coat. Serve immediately. 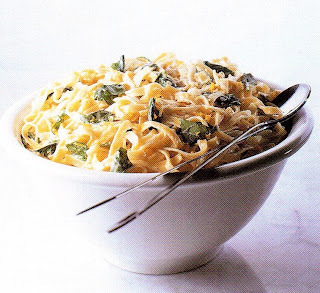 Thin to medium ribbons - linguine, fettuccine. The difficulty of this sauce lies in the timing. The pasta must be ready when the scallops are ready. Scallops become tough if overcooked. A sweet olive oil, preferably Ligurian, will best complement the scallops' natural sweetness. 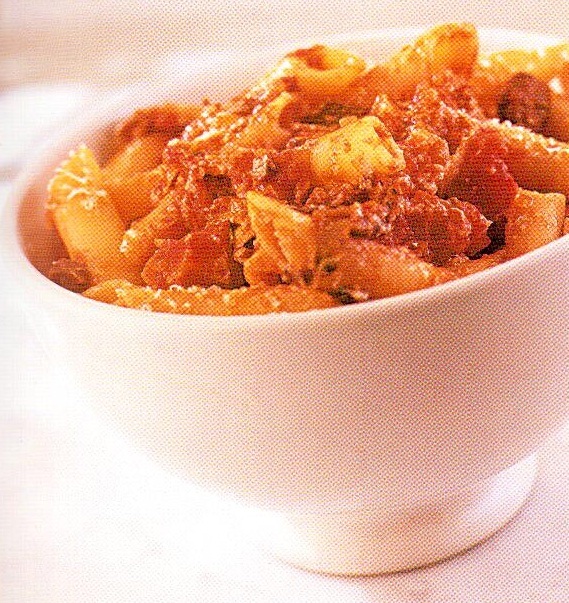 Cook pasta in a large pot of boiling, salted water, until firm to the bite if serving hot or just firm to the bite if serving as a salad. 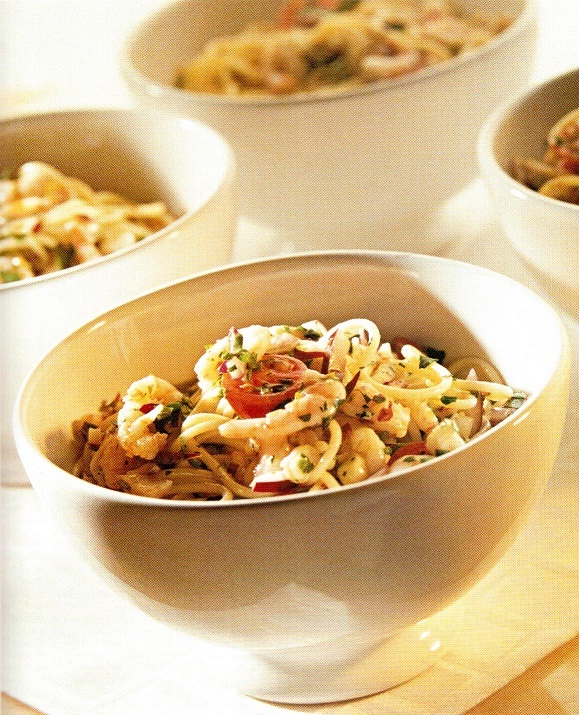 While pasta is cooking, combine shrimp, garlic, onion, red pepper flakes, lemon juice, oil, tomatoes, and basil in a bowl. Drain pasta. Return pasta with shrimp and tomato mixture to the warm pasta pot. Toss well to coat. Add salt and pepper to taste. Serve immediately or at room temperature. 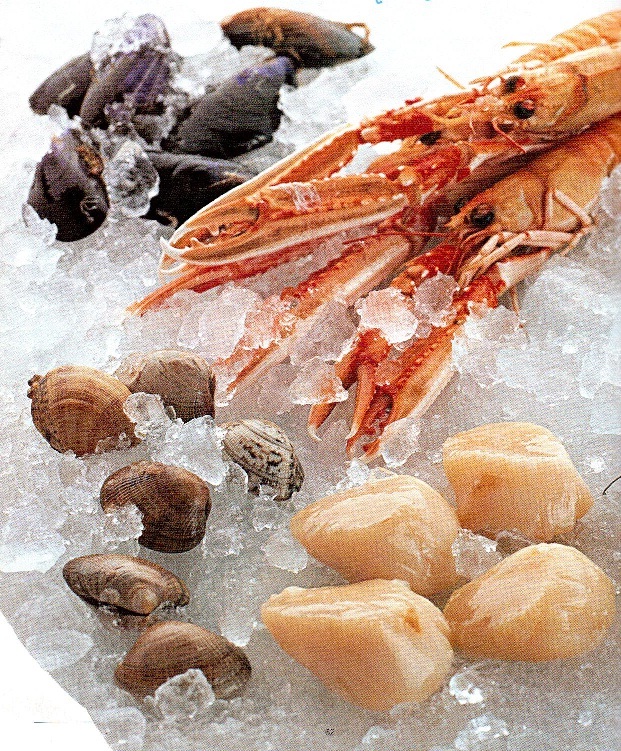 Thin strands or medium shells - linguine, gnocchi, conchiglie. Make up to 8 hours in advance if serving as a salad. Cover and refrigerate. Return to room temperature before serving. For an authentic Italian flavor, use a peppery olive oil from Tuscany or Umbria. Cook pasta in a large pot of boiling, salted water, until firm to the bite. Drain, reserving about 1/2 cup pasta water. Return pasta with butter and chives to the warm pasta pot. Toss well to coat, adding reserved water as needed. Add salmon roe and toss carefully to avoid crushing roe. Add salt and pepper to taste. Serve immediately. 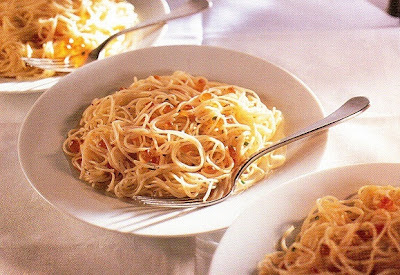 Thin strands - capellini. spaghettini, paglia e fieno. If using capellini or paglia e fieno - called straw and hay - be sure to cook in plenty of boiling water. Stir with a long wooden fork as soon as the pasta slides into the water, and drain when pasta is still slightly undercooked. Cook pasta in a large pot of boiling, salted water, until firm to the bite if serving hot or just firm to the bite if serving as a salad. Drain. Return drained paste to the warm pasta pot. Add tuna, tomatoes, capers, basil, lemon, and oil. Toss well to coat. Add pepper to taste. Serve immediately or at room temperature. Tubes or shells - conchiglie, gnocchi, rigatoni. 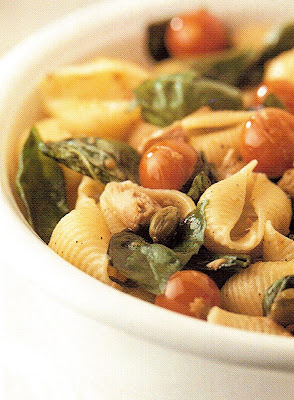 Make up to 1 day in advance if serving as a pasta salad. Cover and refrigerate. Bring to room temperature before serving. Cook pasta in a large pot of boiling, salted water, until firm to the bite. Drain, reserving 1/2 cup pasta water. Return drained pasta to the warm pasta pot. Add butter, vodka, and half the sour cream. Toss well to coat, adding reserved water as needed. Add salt and pepper taste. Top with salmon, remaining sour cream, and dill. Serve immediately. 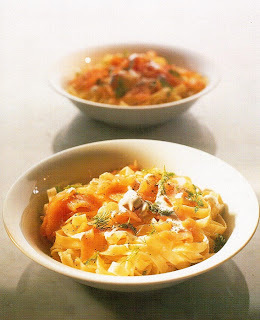 Thin to medium ribbons - linguine, fettuccine. tagliatelle. Soak the porcini. Drain mushroom pieces, reserving the soaking liquid, and finely chop. Set aside. Preheat oven to 400°F (200°C ). For bechamel, melt butter over medium heat in a heavy saucepan. Whisk in flour and cook until foaming, about 1 minute. Remove from heat and gradually pour in milk, whisking constantly. Return to heat and cook, whisking constantly, until sauce thickens, about 2 minutes. Bring to the boil and remove from the heat. Add salt, pepper, and nutmeg to taste. Stir in porcini mushrooms and reserved soaking liquid. In a small pan, melt butter with oil and add fresh mushrooms, thyme, and garlic. Cook over medium high heat, stirring frequently, until mushrooms are just colored, 5 minutes. Remove from heat. Stir in to bechamel. Meanwhile, cook pasta in a large pot of boiling, salted water, until just firm to the bite. Drain. Combine drained pasta and mushroom bechamel. Add 2 tbsp of the parmesan. Toss. Place in a buttered 12in x 8in x 3in (30cm x 20cm x 7.5cm) oven-proof dish. Sprinkle the remaining parmesan over top. Bake until golden and bubbling, 10 minutes. Leave to stand for 5 minutes before serving. Tubes or shells - penne, macaroni, rigatoni, conchiglie. Assemble and leave to cool completely unbaked. Cover, unbaked, and refrigerate up to 1 day in advance. Alternatively, freeze up to 3 weeks in advance. Defrost overnight in refrigerator. Cook in preheated 400°F (200°C) oven for 30 minutes. Soak the dried porcini. Drain mushroom pieces, reserving the soaking liquid, and finely chop. Set aside. Melt butter with olive oil in a skillet over medium heat. Add onion and garlic and cook until softened, 5 minutes. Add tomatoes and cook, stirring occasionally, until thickened, 10 minutes. Adjust heat to low. Add porcini mushrooms and reserved soaking liquid and simmer gently for 5 minutes. Meanwhile, cook pasta in a large pot of boiling, salted water, until firm to the bite. Drain. Add pasta to the hot sauce. Toss well to coat. Serve immediately with parmesan. Strands, tubes or shapes - spaghetti, penne, fusilli. Cook pasta in a large pot of boiling, salted waler, until firm to the bite. While pasta is cooking, melt butter with oil in a skillet over medium high heat. Add garlic and mushrooms and cook, stirring frequently, until just colored, 5 minutes. Add wine and simmer until just evaporated. Stir in cream and simmer gently until just thickened, 1-2 minutes. Drain pasta, reserving about 1/2 cup pasta water. Add pasla to the hot sauce. Toss well to coat, adding reserved water as needed. Serve immediately with parmesan. Medium to wide ribbons - fettuccine, tagliatelle, pappardelle. 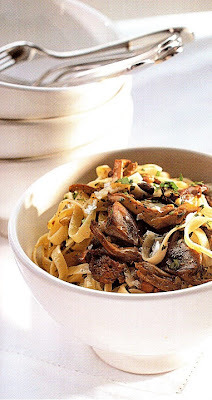 Use portobello or cremini mushrooms for this dish if wild mushrooms are beyond the budget or not available. For a superlative dish with an even deeper mushroom flavor, we strongly recommend adding dried porcini mushrooms (see variation below). Soak loz (25g) packet of dried porcini. Finely chop and add to the hot pan with the garlic and fresh mushrooms. Cook as directed. Add the reserved mushroom soaking liquid with the wine. Finish as directed. Heat oil in a skillet. Add garlic and shallots and cook over medium high heat until fragrant, 1 minute. Add mushrooms and cook, stirring frequently, until tender and colored, 10 minutes. Add salt and pepper to taste. Meanwhile, cook pasta in a large pot of boiling, salted water, until firm to the bite. Drain, reserving 1/2 cup pasta water. Add pasta with parmesan and parsley to the hot mushrooms. Toss well to coat, adding reserved water as needed. Serve immediately with additional parmesan. 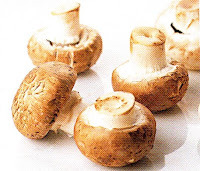 There are many varieties of wild mushrooms. You can use a single variety or a mixture for this recipe. Our preferred choice would be fresh porcini or chanterelles, but portobello mushrooms and cremini mushrooms have a good rich flavor, are easy to find and inexpensive. 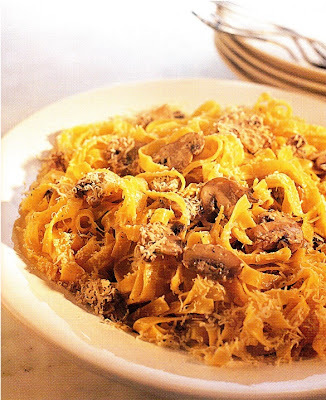 The very best and most authentic mushrooms for pasta are the meaty textured, earthy flavored porcini and boletus varieties, but cultivated cremini and portobello mushrooms, especially in combination with dried porcini, are an acceptable and economical substitute. White button mushrooms, however, are not. 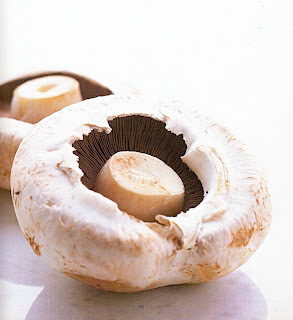 To boost and enhance the flavor of cultivated mushrooms, mix 1/2oz (15g) of dried porcini with 8oz (250g) fresh mushrooms. Never wash fresh mushrooms under running water. To clean, use a damp cloth or piece of paper towel and wipe away any dirt. 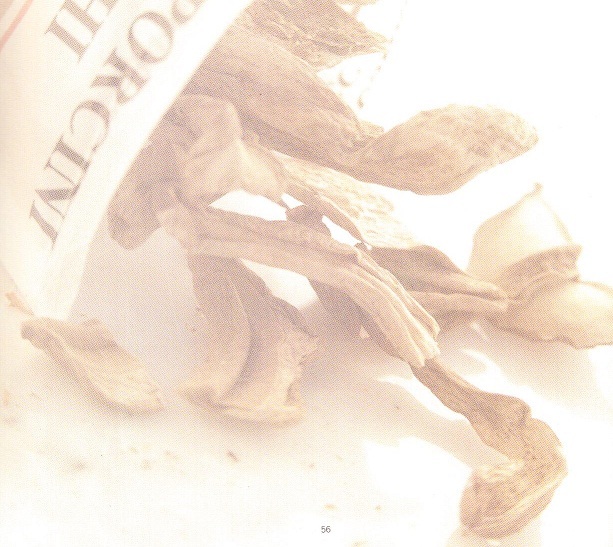 When buying dried porcini, choose the packets with the largest mushroom pieces, as they come from the caps. The smaller, crumbly bits are the dried stalks and have less flavor than the caps. Porcini should be reconstituted in hot water for a minimum of 30 minutes. 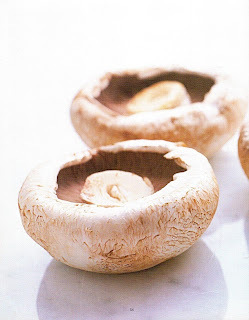 Try the following alternative method when making creamy mushroom sauces: place the porcini in small pan with equal amounts of water and milk to cover. Bring to a boil and boil for 1 minute. Remove from heat and leave to soak for 20 minutes. Use the soaked mushrooms and flavorful milky soaking liquid in the sauce. Dried porcini will keep in a cool, dark place for up to 1 year. Cook pasta in a large pot of boiling, salted water, until firm to the bite. While pasta is cooking, place butter and cream in a skillet over medium low heat. Heat through, then simmer gently until just thickened, 1-2 minutes. Add salt and peppier to taste. Drain pasta. Add pasta with parmesan to the hot sauce. Toss well to coat. Serve immediately with additional parmesan. 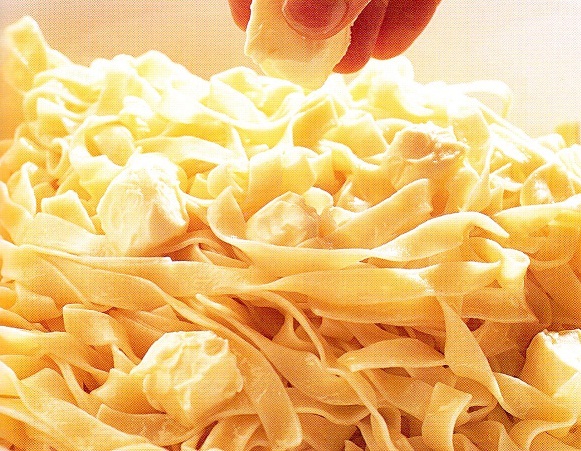 Medium to wide ribbons - fettuccine, tagliatelle. 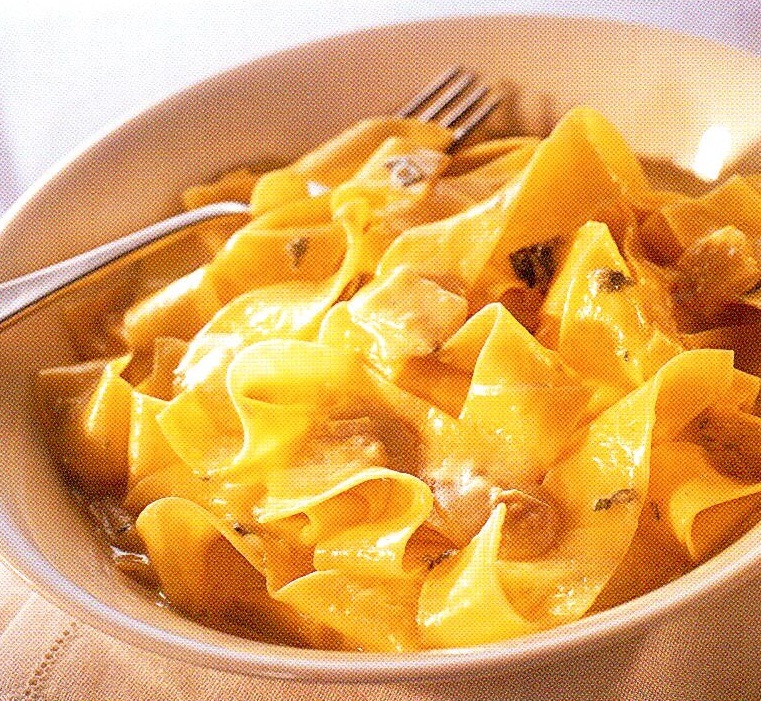 pappardelle. 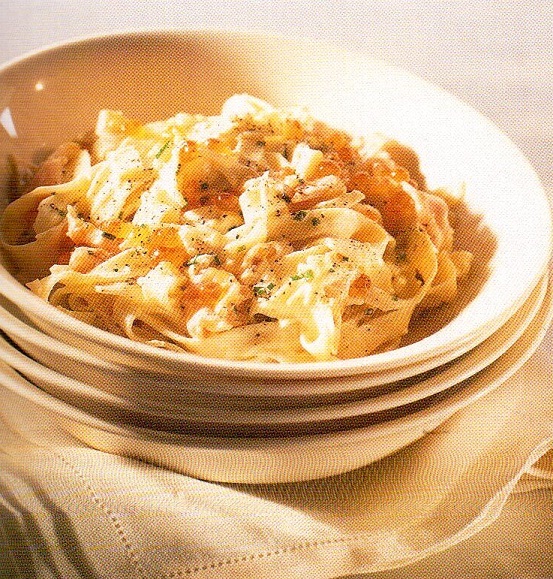 Fettuccine is the traditional pasta to serve with this famous sauce. Alfredo was the owner of a restaurant in Rome where the great and the good flocked in the 1950s and 60s. He used to give a final toss to the tagliatelle with a large gold fork and spoon before setting the dish on the tables. Melt butter in a skillet over medium heat. Add shallot and cook, stirring frequently, until soft, 5 minutes. Add saffron, saffron water, and wine and simmer rapidly until reduced by half, 5 minutes. Add cream and cook until thickened, 1 minute. Add salt and pepper to taste. Meanwhile, cook pasta in a large pot of boiling, salted water, until firm to the bite. Drain, reserving 1/2 cup pasta water. Add pasta to the hot sauce. Toss well to coat, adding reserved water as needed. Serve immediately. Cook pasta in a large pot of boiling, salted water, until just firm to the bite. Drain, reserving 1/2 cup pasta water. Return pasta with butter to warm pasta pot and stir to coat. Add gruyere, fontina, mozzarella, parmesan, and cayenne. 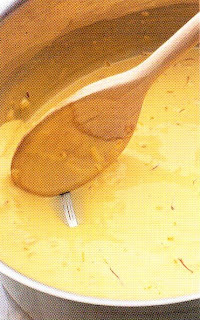 Mix thoroughly until the cheese is melting but not completely melted. Sprinkle with 1 tbsp additional parmesan and breadcrumbs. Place in a buttered 12in x 8in x 3in (30cm x 20cm x 5cm) oven-proof dish. Bake until just golden and crusty, 10-15 minutes. Leave to stand for 5 minutes before serving. 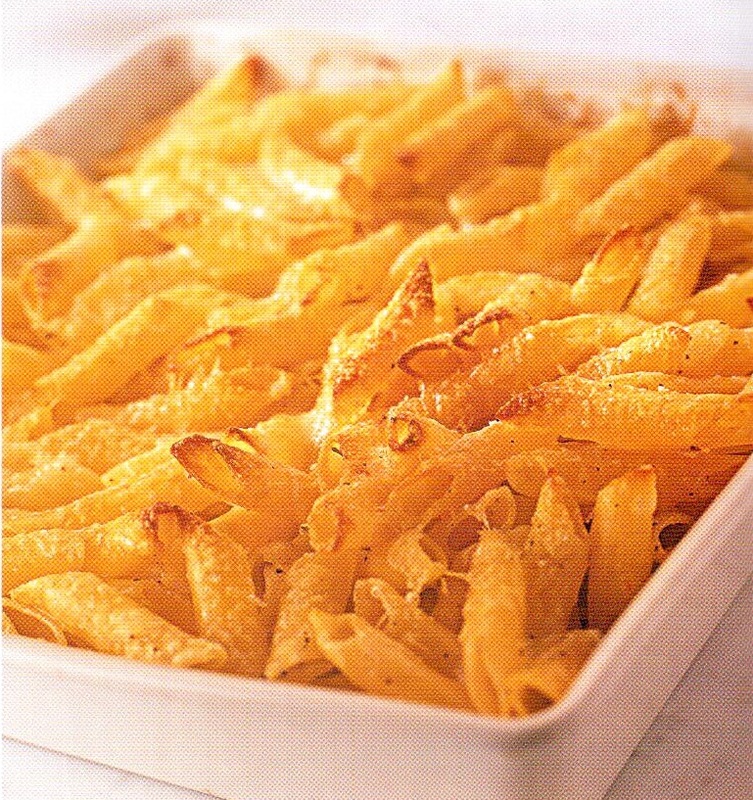 Medium tubes or shapes - penne, macaroni, fusilli, conchiglie. Assemble up to 1 day in advance. Cover, unbaked and refrigerate. Allow an extra 5 minutes in the oven when cooking from cold. 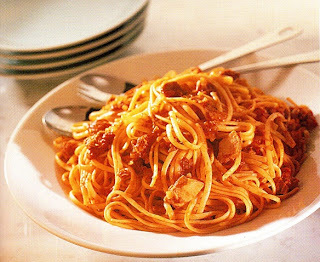 Cook pasta in a large pot of boiling, salted water, until firm to the bite. 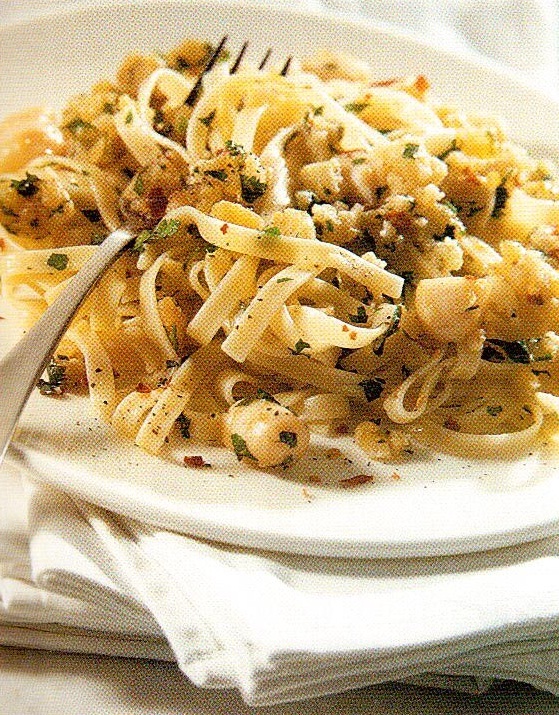 While pasta is cooking, place lemon juice and zest and mascarpone in a skillet over medium low heat. Warm gently, stirring constantly, until heated through, 3-4 minutes. Add salt and pepper to taste. Drain pasta, reserving 1/2 cup pasta water. Add pasta with basil to the hot sauce. Toss well to coat, adding reserved water as needed. Serve immediately. Ribbons or strands - linguine, fettuccine. tagliatelle. Mascarpone is an Italian cream cheese; here its richness is lightened by the lemon and the basil. 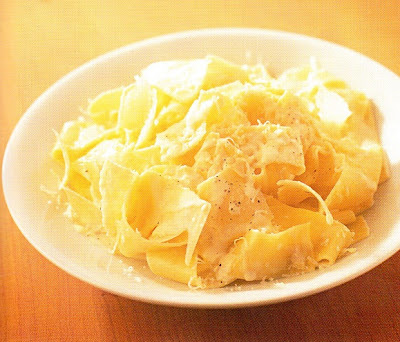 Ribbons - tagliolini. 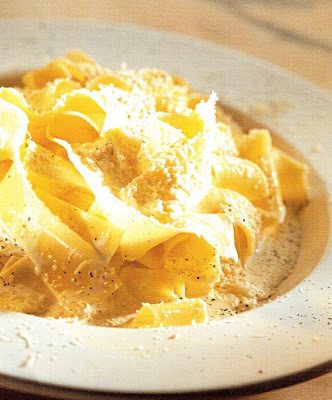 fettuccine, tagliatelle. papardelle. Cook pasta in a large pot of boiling, salted water, until firm to the bite. Drain, reserving 1/2 cup pasta water. Return pasta with gorgonzola, ricotta, and butter to the warm pasta pot. Toss well to coat, adding reserved water as needed. Add salt and pepper to taste. 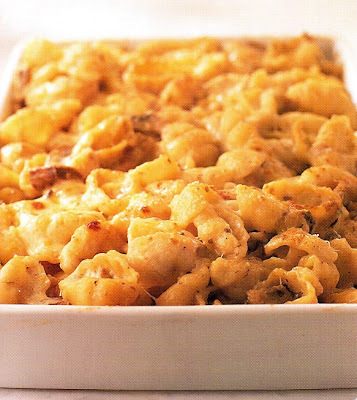 Serve immediately, sprinkled with an additional 2 tbsp gorgonzola. medium tubes or shapes - ditali, penne, macaroni, fusilli. conchiglie. Add 2 handfuls baby spinach leaves to the drained pasta wilh the gorgonzola and ricotta. Finish as directed. 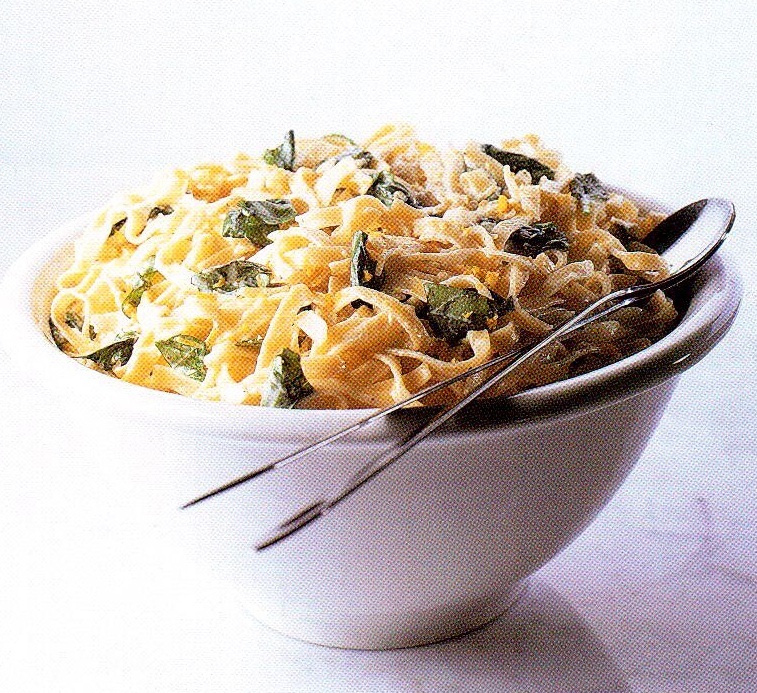 Add 1 handful fresh basil leaves to the drained pasta with the gorgonzola and ricotta. Finish as directed. Add 2 handfuls arugula leaves to the drained pasta with the gorgonzola and ricotta. Finish as directed. Cook pasta in a large pot of boiling, salted wafer, until firm to the bite. Drain, reserving 1/2 cup pasta water. 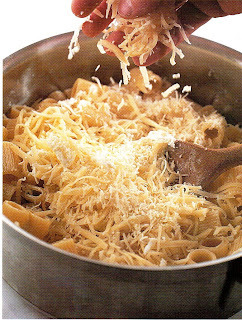 Return drained pasta with parmesan, your choice of cheeses, and butter to the warm pasta pot. Toss well to coat, adding reserved water as needed. Add pepper to taste. Serve immediately. Mix cream, egg yolks, and parmesan in a bowl until combined. Meanwhile, cook pasta in a large pot of boiling, salted water, until firm to the bite. Drain pasta, reserving 1/2 cup pasta water. Return pasta to the warm pasta pot. Add cream mixture and toss well to coat, adding reserved water as needed. Add salt and pepper to taste. Serve immediately with additional parmesan. Ribbons - fettuccine, tagliatelle, pappardelle. Cook pasta in a large pot of boiling, salted water, until firm to the bite. Drain. Return pasta to the warm pasta pot. Add butter to the pasta. Toss well to coat. Add parmesan and salt and pepper to taste. Serve immediately with additional parmesan. Strands or ribbons - spaghetti, tagliolini, fettuccine, tagliatelle, pappardelle. Don't hold back on the black pepper - this dish is best with generous amounts. Add 4 slices ham, cut into short, fine strips, 1 in (2.6cm) long and 1/4 in(0.5cm) wide, to pasta with butter. Finish as directed. Add 2 tbsp finely chopped fresh flat-leaf parsley to pasta with butter. Finish as directed. Cook 8oz (250g ) small asparagus tips in boiling, salted water until just tender, 2-3 minutes. Drain and add immediately to hot pasta with butter. Toss gently to avoid crushing. Finish as directed. Cook 4oz (125g) tiny frozen peas in boiling, salted water until just tender, 2 minutes. Drain and add immediately to hot pasta with butter. Finish as directed. No pasta lover's pantry is complete without a wedge of Parmesan in the refrigerator. Always buy Parmesan in a piece, never pre-grated. It's best to buy a wedge that weighs no more than 8-10oz (250g-300g), as a larger piece will probably dry out before you use it up. Store wrapped in foil in the warmest part of the refrigerator. If it does dry out, try wrapping it in a piece of damp cheesecloth to re-moisten. Parmesan can be frozen and it will retain its flavor well, but it will become too crumbly to grate when defrosted. We always buy Italian Parmesan and, whenever possible, Parmigiano-Reggiano. 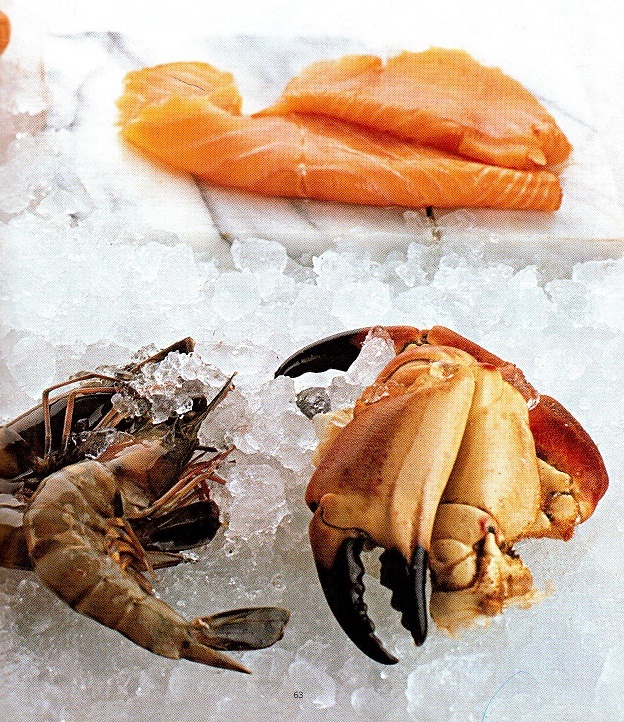 Although more expensive, it is unquestionably superior in flavor and texture. We like to present Parmesan at the table in a manageable piece with a small hand grater and allow everyone to enjoy freshly grating their own additional cheese. Otherwise, grate it first in the kitchen and serve it in a bowl. 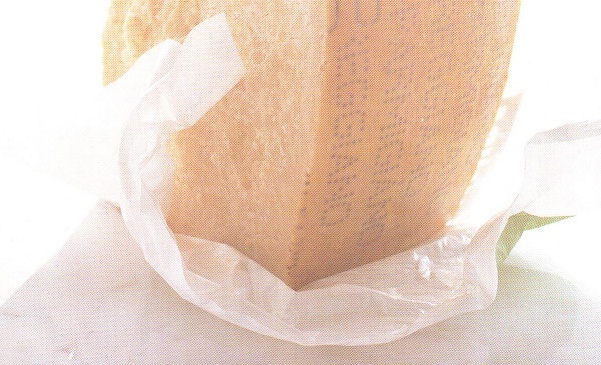 Pecorino Romano is a tangy, salty sheep's milk cheese which is also suitable for grating. 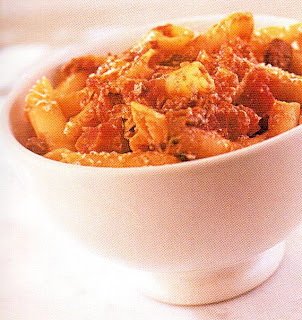 It is traditionally served with pasta dishes originating from Southern Italy, where pungent flavors dominate. When called for in a recipe, it is because the distinctively sharp taste of Pecorino is the best complement to the sauce. And, although we do list grated Parmesan as an alternative, we urge you to seek out Pecorino cheese from Italian specialty and gourmet stores to serve when it is the most appropriate choice for the recipe. Gorgonzola is a creamy colored, blue-veined cheese with a flavor that varies from mildly tangy to piquant. 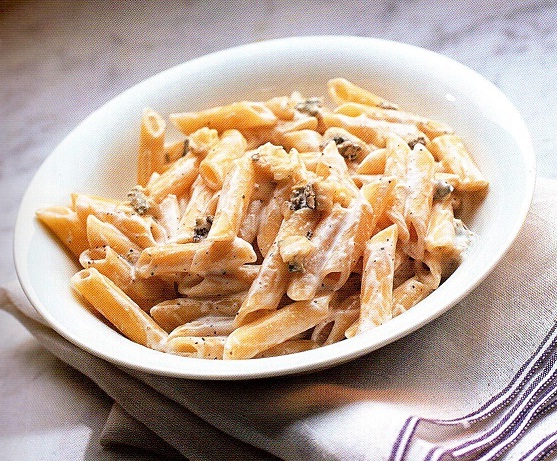 When buying Gorgonzola for pasta, remember that the creamier the consistency, the mellower the flavor. When buying mozzarella at the supermarket, always choose whole milk "fresh" mozzarella that comes in a squashed, ball shape and is sold in plastic bags surrounded by water. Never buy die rubbery blocks of mozzarella. Real mozzarella is made from the milk of the Italian water buffalo and has a fresher flavor than mozzarella made from cow's milk. But, for cooking, the superior buffalo mozzarella is not essential.